Raise your hand if you are a Crab Cake lover like my husband and I are. As much as I/we enjoy them, they are rather pricy, especially when feeding a crowd. 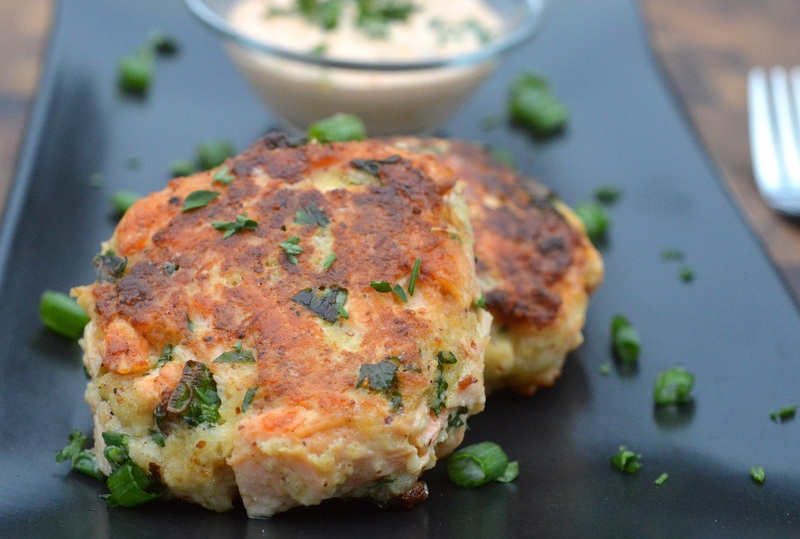 Ever wonder how to make Salmon Cakes? If so, do you eat it often? My teen son could eat salmon, particularly blackened salmon, 5 days a week if it were up to him. I try and inject some variety into his enjoyment of it by making salmon a number of ways, one of which is these Salmon Cakes. 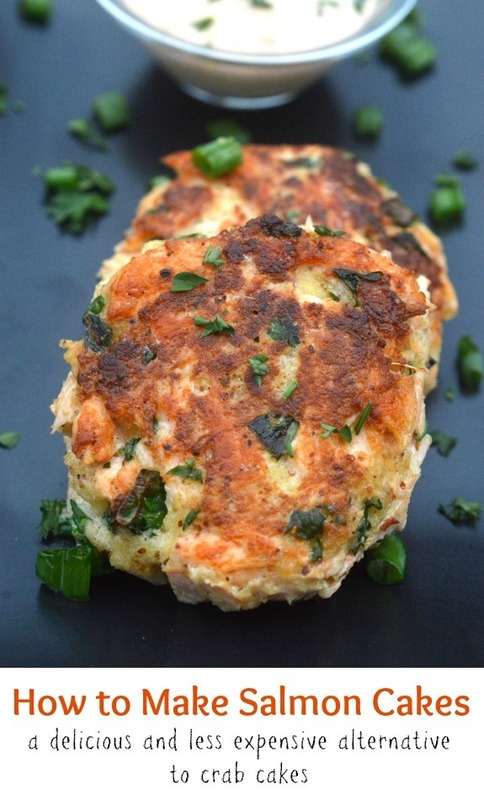 Salmon Cakes are delicious in my opinion, they are easy to make and they are one of those meals that you can prep ahead of time and when dinner rolls around, all you need to do is give them a quick saute add a side or a salad and you have yourself a nice meal. Salmon Cakes also make a great dinner party offering. You can make them as mini’s for an appetizer or full-sized as an elegant entree. For barbecues, I like to offer Salmon Sliders with a Roasted Red Pepper Mayo for those that aren’t into burgers, etc. How Do Salmon Cakes Compare To Crab Cakes? The texture of Salmon Cakes is similar, however, the taste is different since salmon has more of a flavor on its own vs crabmeat. The yield from both 1 pound of crab and 1 pound of salmon when making them into “cakes” are the same 7-8 cakes. Can I Freeze Salmon Cakes To Cook Later? To make delicious Salmon Cakes, you start with fresh salmon. You first want to cook the salmon by either oven baking it or poaching it. Allow it to cool and then flake the meat into a bowl. To that, you add the rest of your ingredients (I use an egg, mayo, Dijon mustard, fresh lemon, red pepper, parsley, scallions, black pepper, salt, and breadcrumbs. I always recommend using fresh breadcrumbs when possible for making both these salmon cakes and crab cakes. SO much better vs traditional store-bought breadcrumbs. I like to scoop out the inside of a fresh French baguette for this. I form the mixture into cakes, allow the cakes to chill, covered in the refrigerator an hour or more, then pan fry them in a bit of grapeseed or olive oil. One of the best parts, in my opinion, is a crispy exterior (same goes for crab cakes). 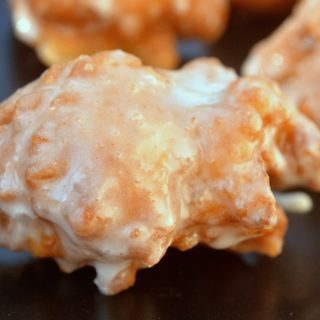 I enjoy them browned as shown in the photos, its a great delicious contrast to the soft texture of the cake overall. You can choose to serve them with tartar sauce, a homemade aioli or by jazzing up store-bought mayonnaise with a few ingredients to make a sauce. You can customize your Salmon Cakes any way you choose. 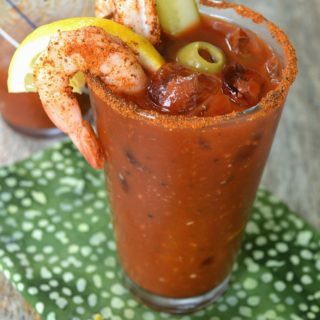 Add in dill, or if you like some seafood seasoning. Add in minced onion and peppers in place of the scallions (however I would saute them first to soften them). Capers are an option as well. You could even add in black beans to stretch the cakes further as well as give them even more protein (I would help flavor the beans by tossing them with lime/lemon juice, garlic, and onion salt prior to adding them). Let me know if you make these as is or if you come up with your own twist, I’d love to hear about it! 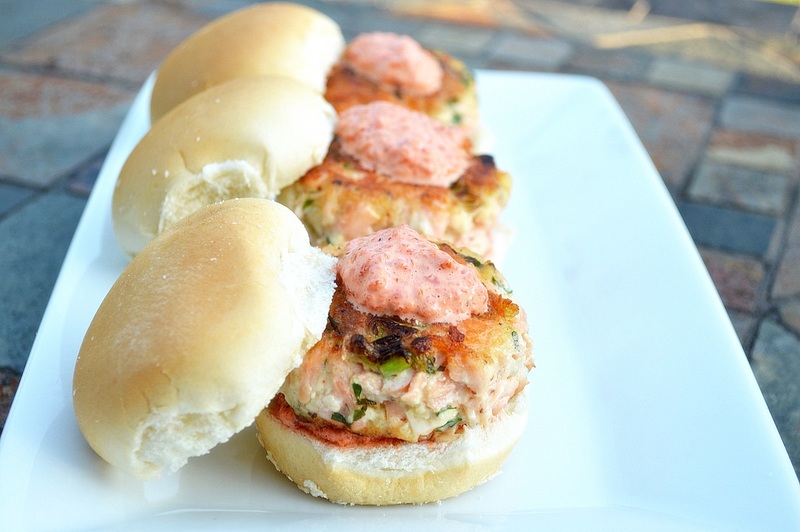 Here is a throwback to my Salmon Sliders posted back in 2013. 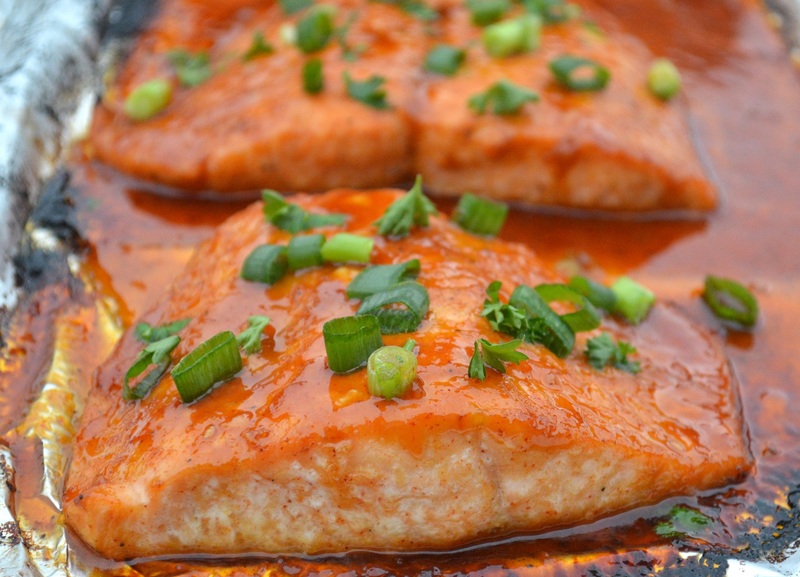 This Asian Salmon In Foil takes literally 20 minutes to make AND is restaurant quality! You just can’t mess it up. 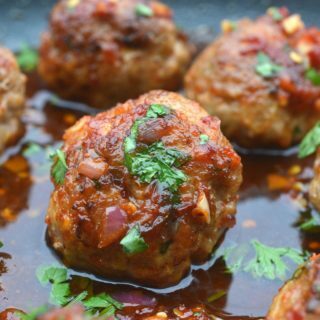 Perfect for a busy weeknight OR a weekend dinner with guests. I hope you make this (let me know if you do)!! Salmon Cakes are great for a weeknight dinner, as part of a salad or even as a dinner party entree. Fill a medium saucepan halfway with water. Place salmon in the pan, cover and cook over high heat until simmering. Reduce heat to low and cook for about 5 minutes. You want the salmon almost cooked through. Remove from heat, remove your salmon from the pan and let your salmon cool. You can also cool and place in the fridge at this point until ready to use (next day). 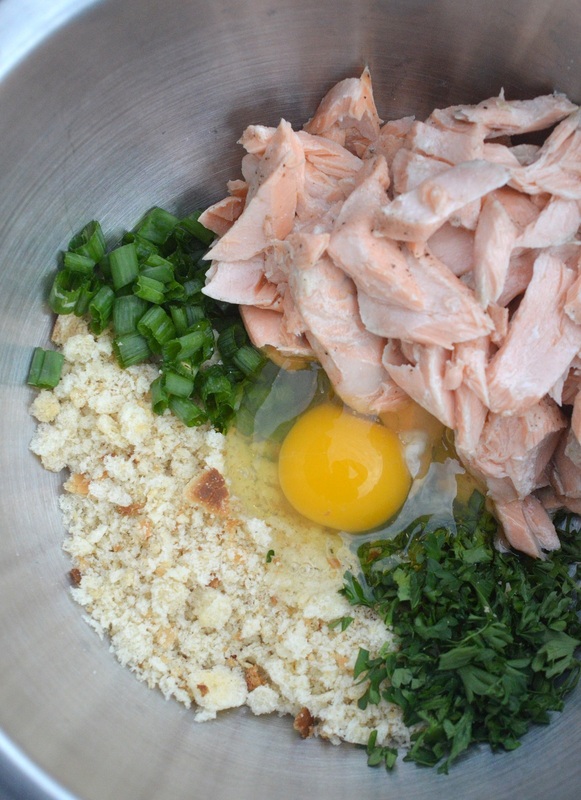 When ready to assemble your salmon cakes, use a fork and flake the salmon into a bowl (my kids love doing this part) discard the skin. If your salmon looks really wet, gently blot it dry a bit with a paper towel. Add in the scallions, egg, parsley, breadcrumbs, mayo, lemon juice, mustard, salt & pepper and red pepper (if using). Gently combine the mixture with your hands, spatula or large spoon. Don’t overwork it. Form into cakes/patties and place on a parchment or wax paper lined plate, separate layers of sliders with additional parchment. 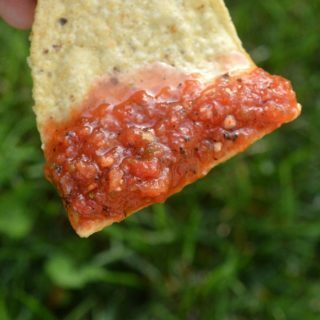 Taste and adjust seasoning to your preference. Cover with wrap and chill for at least 30 minutes or overnight. When ready to cook the salmon patties, place just enough olive or grapeseed oil in the pan you use to just lightly coat the bottom. Heat the oil over medium heat, add the salmon cakes (allowing room between each cake to flip them). and cook 3-4 minutes per side, adding a little more oil if necessary. If cakes begin to brown too much, remove the pan from heat for 15-30 seconds and reduce heat to low to finish them off. Serve with tartar sauce or make a simple Sriracha Mayo by combining Mayo, a little Sriracha, a squeeze of lemon juice and black pepper. Taste and adjust to your preference. 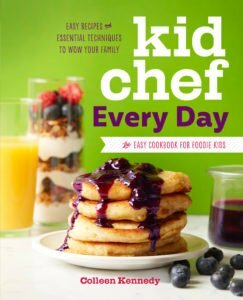 Notes: When it comes to breadcrumbs for salmon cakes and crab cakes for that matter, fresh is best (really). I like to use the inside of a fresh loaf of French bread. If you wish to bake your salmon vs poaching it, that works as well. As a matter of fact, buy a larger piece of salmon for dinner and bake it brushed with a bit of olive oil, then season with salt & pepper, spritz it with some fresh lemon when done and enjoy. Save the leftovers for making salmon cakes.